﻿The oldest golf course in the area and one of the most popular is Mimosa, located within the Mimosa resort area, it features 36 holes. Peak season is Oct-Mar, it will take 5 hours + to play a round during that time frame. ﻿ Lots of water, sand, and hazards make this a challenging course. For beginners, Fontana has a small 9-hole par 3 golf course, great for family fun. It is not well shaded, so bring the umbrella and cap to protect against bright sunny days. If you have transportation, and want to play a more shaded par 3 course, we're recommend Angeles City Sports and Country Club located on Zeplin Street nearby by Hensonville. The course takes a beating during the dry hot summers, but the rest of the year is lots of fun. The Head Caddymaster is a member of the Professional Philippines Golfers Association. The long and wide fairway style driving range is my favorite in the area. It has cover for sunny and rainy days and is operated by Mr. Lee who is an excellent golf teacher. We've seen the results of his students and they have a stunning swing! 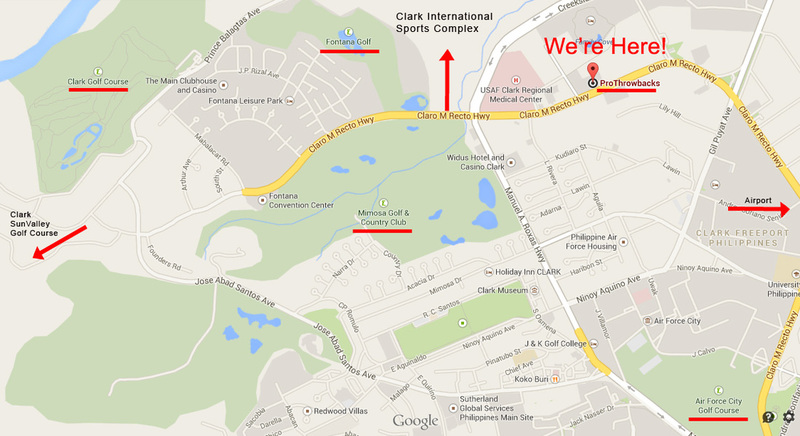 The most economic is the Clark Air Force Course a.k.a. Mekeni. Operated by active duty military offers budget golfers a way to play at a fraction of the cost. The greens are slower than normal and during the dry season or hot summer months, the fairways are fast and brown. No golf carts are available! A lack of restrooms on the course may turn some older golfers away, but pull carts and vintage caddies are still available. The military is pro-golf and you'll be treated like a VIP. The map shows an area called "Clark Golf Course:, however, it goes by the name of Korean Golf Course and Country Club, but we heard that will change soon as well. It features 27 holes and it's located on the backside of the Fontana resort. If you must play every course in the area, upon exiting the Clark Mabalacat gate, turn left for about 2k and you'll run into Marina Hills, which also offers good rates and challenging approach shots. Run and operated by the local government make it affordable to most. We can mention Beverly just briefly, its about 25K away from Clark, they have the best driving range in the area. The golf course expanded to 18 holes in 2014. We saved the best for last....Clark Sun Valley features 36 holes. The first 9 holes opened in 2013 and the final 36th hole finished in 2014. Without question, its the best maintained course in the area! Green fees are nearly the same and a bargain considering what you're getting. Carts are mandatory because of the terrain. Imagine playing golf in the grand canyon...such a spectacular view on both the Public (Sun Valley) and Member (Clark) courses. Workers are constantly improving the landscape. This is the only course that ProThrowbacks is a member of, there's no monthly fees and all we pay for is the cart, caddy, and insurance. Go horseback-riding along the Sacobia River! One of the activities in Clark is horseback riding at El Kabayo Riding Stables. While you can take the horse around the area, if you are adventurous and up to the challenge, why not go for a ride down to the Sacobia River and enjoy the lahar canyons created by the eruption of Mount Pinatubo? comparable to Tagaytay, a billion-peso view of Clark, surrounding cities and towns, overlooking the Sacobia River, Mounts Pinatubo and Arayat, and other mountains and majestic sceneries for everybody to enjoy. It is the home of Zoocobia Fun Zoo and Vista Montana Pool. Take a dip at Puning Hot Springs! The Greater Clark area is a mecca for international cuisine and Don Juico and Fields Avenues bring you around the world with their international restaurants. Among the favorites are C' Italian Dining, Iguana's (Mexican), VFW (American), AC Rumpa (American), Cottage Kitchen (Cajun/Creole), Red Sea (Lebanese), Hana-Mi (Japanese) . . . the list is endless! There's even a Korea Town with over a hundred restaurants along Friendship Highway. Play golf at the many golf courses! Take your pick! There are golf courses at Clark like Mimosa and Fontana to suit your golf passion. You can also try the nine-hole golf course at Angeles Sports and Country near Hensonville. Try your luck at the many casinos! Raise your adrenalin at Clark International Speedway! Be thrilled with the fast and the furious racing enthusiast with their modified and extremely fast cars. Satisfy your hunger for speed by watching a variety of motor sports on a course designed for drag racing, circuit racing, off roading, and drifting. Ride a mountain bike around Clark and Sacobia at sunset! The zigzag, uphill, and downhill roads of the Clark and Sacobia area make for a challenging fresh-air ride. Join other bikers every evening in this healthy and environmentally sound trip. Watch a cultural dinner-show at the Museo ning Angeles! The best of Kapampangan hospitality: a buffet spread consisting of the most delectable cuisine and the finest of music and dances. Truly a feast for the mind, body, and soul. For reservations, call: (045) 887-4703 or email angelesmuseo_kfi@yahoo.com. Dare to go to Adventure Park @ Clarkland! houses, function tents, waterpark, ATVs, boardwalk, picnic grounds, souvenir shops, and biking area. All at reasonable prices. 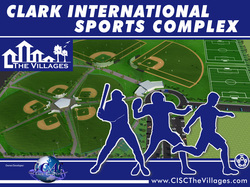 Coming soon, we'll have a comprehensive list on all types of activities on Clark. For those who wonder what that huge stadium along the NLEX highway is all about....here's some information about that stadium. Philippine Arena is a world class indoor arena. Upon its completion will be the largest dome arena in the world. It is being constructed in Ciudad de Victoria, Bocaue and Santa Maria, in the province of Bulacan, Philippines. It is a project of the Iglesia Ni Cristo (Church of Christ) as part of its 100th year of re-establishment in the Philippines on July 27, 2014. The arena is expected to have a seating capacity of 55,000. Groundbreaking ceremony was held on August 17, 2011. Architectural design were provided by Populous, an architectural design firm based in Kansas City, Missouri. Construction of the arena was awarded to Hanwha Engineering and Construction Corporationof Korea. The audio and video consultant is Engineering Harmonics. The arena is designed as an auditorium. It will hold major church gatherings. It will also operate as a multi-us sports and concert venue capable of holding a range of events, from boxing, basketball, footaball, and live music. According to INC Executive Minister, Bro. Eduardo V. Manalo, the Philippine Arena can be used not only by the Church but by the public in general whether for local or international events. It can also host a number of regional sporting events such as SEA Games and Asian Games since the New Era University Sports Complex is also being constructed nearby. Here's a drive-by photo of the new stadium as of May 19, 2013. Sorry for the slight blur, but going 100 clicks on NLEX north and lowering the window and just a quick shot will have to do for now. Get excited folks, this will the best stadium in the Philippines. There are many golf courses in the area. Please stop by ProThrowbacks and we'll give you a map of the 4 golf courses on Clark, the best one is coming soon, and two outside the Freeport Zone.